How do I become a member of The Holbrook Club? Becoming a member with us is easy. Just click this link join now and you can join online and get started straight away, otherwise pop in and a member of our team can get you set up. What membership options are available to me? We have a variety of different membership packages to choose from to suit your lifestyle. To find out more, click here. Am I able to see the club’s facilities before joining? We’d be more than happy to show you around the club before you sign your membership forms. Please call our office on 01403 751150 to arrange a tour. Do I get any discounts as a member? As a member you’ll be entitled to a range of discount benefits including discounts on food and drink and also events throughout the year. Click here to read more about membership benefits. How do I book to use one of your sports facilities? Booking to use our sports facilities, such as the tennis courts or sports hall, is simple. Just call click this link book now and register and you’ll be able to manage all your bookings 24/7. Can my children use the clubs facilities unaccompanied? Children aged 14-17 can sign up for their own membership card free of charge as part of your membership package and can use the club for the sports facilities/gym unaccompanied. Children under the age of 14 must be accompanied and supervised by an adult at all times. Please read the clubs bye-laws section 5 for rules on children using the club. How do I pay for food and drink at the Club? 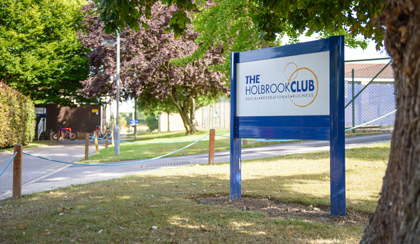 When you become a member of The Holbrook Club, we’ll offer you a Member’s Privilege Card that allows you to pay money onto your membership that can be used at the bar with discounted rates. Am I able to join one of The Holbrook Club’s sports teams? Our teams are always looking for new members and we’d be delighted to hear you’d like to join. Please ask at Reception for more information or call 01403 75110. Should I wish to cancel my membership, how much notice do I need to give? We hope you won’t wish to cancel your membership but if you do want to, you must give at least one calendar months notice in writing. This can be delivered to our Reception.